As foodies, we enjoy learning about different cuisines. 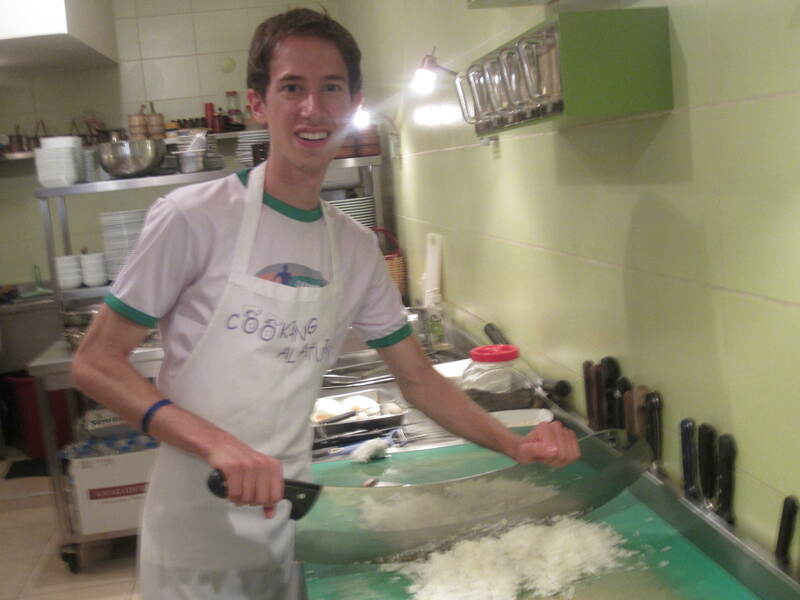 Our ethnic culinary adventures have ranged from experimenting with a traditional Greek food to popular Korean dishes. 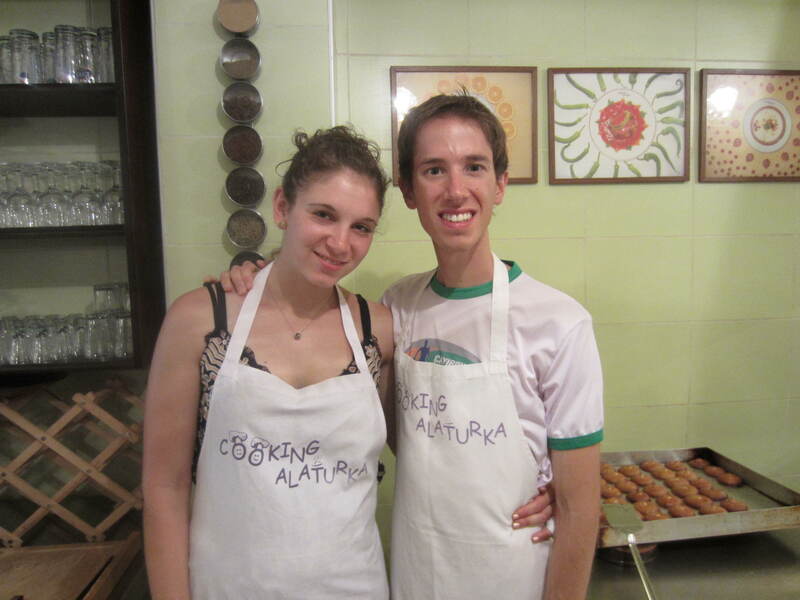 Food was a big part of our travels this past July in Turkey and Israel. We encountered new ingredients and new flavors, and we gained a new perspective on cooking, as well as a renewed respect for specific ingredients. In Turkey, ingredients are simple and unadulterated. There are hardly any incredibly complicated dishes. The natural state of food is heavily emphasized, and this brought us back to the basics of cooking: using fresh ingredients. The Turks often love to take seasonal and local ingredients and cook them with some olive oil and a few spices. This method of cooking brings out the flavors in a way that is not complicated or overwhelming, but just perfectly balanced. 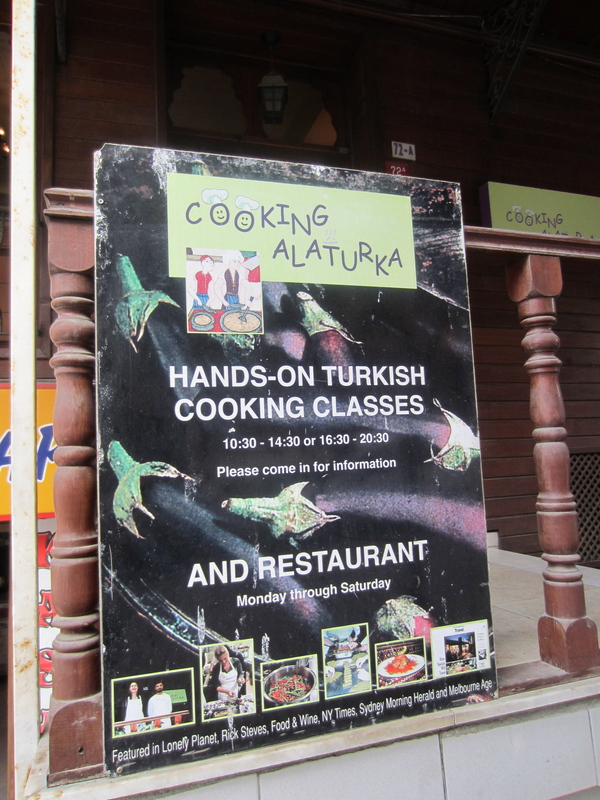 To help us learn about Turkish cuisine, we took a class at Istanbul’s first Turkish cooking school, Cooking Alaturka. We were led by Eveline Zoutendijk, a trained chef and fluent English speaker, as well as Feyzi, a Turkish chef, who was on hand to demonstrate techniques and offer assistance. We were lucky enough to have a private lesson; Eveline and Feyzi provided us with their undivided attention for close to 4 hours. The class was fun, informative and, best of all, hands-on. We were involved in the preparation of 5 different dishes, which included Ottoman classics and home-cooked Turkish favorites. 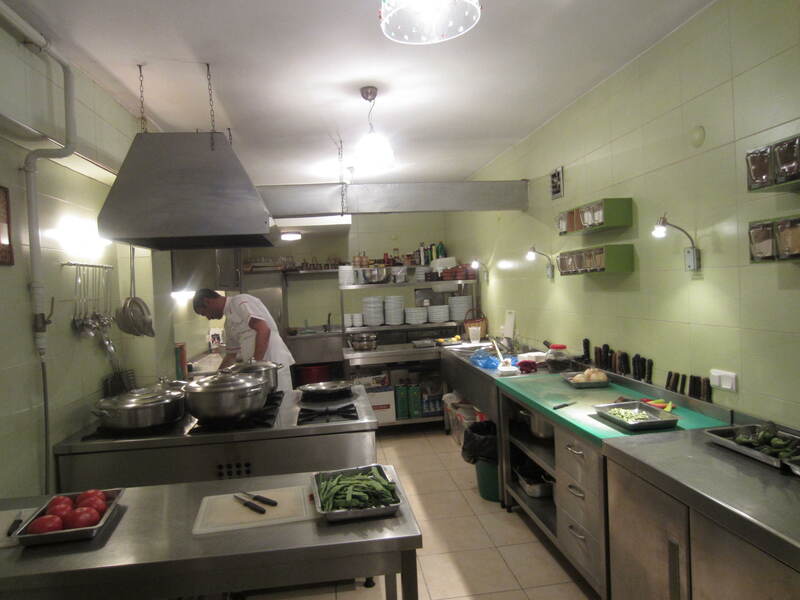 Where the magic happens…AKA the kitchen! Of course, we had to modify the typical menu to be vegetarian and Crohn’s friendly. Originally, the menu called for lamb and fig dishes, which we had to substitute. We were able to substitute mushrooms for lamb, and we omitted figs from one of the dishes. 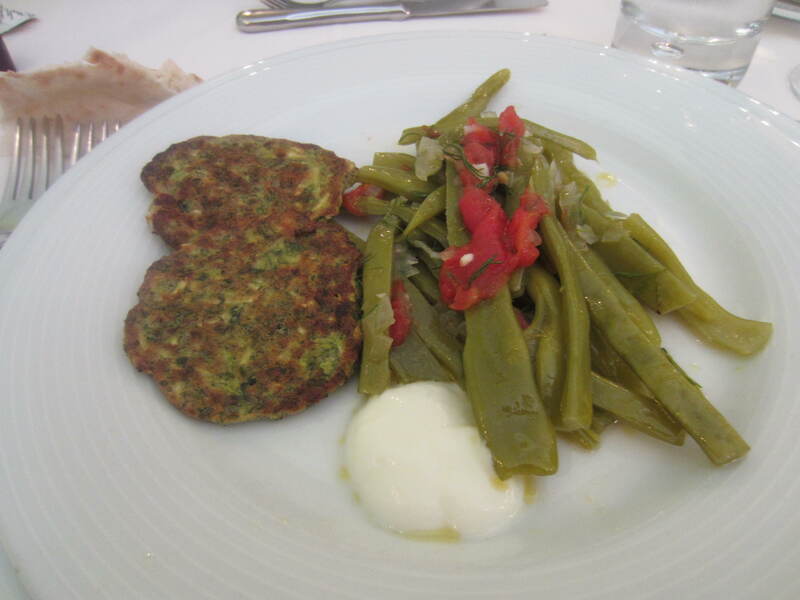 We also had to replace a vegetable side dish of white beans in tomato sauce with a green runner bean side dish. We are so grateful to Eveline for being so flexible in meeting our dietary needs. 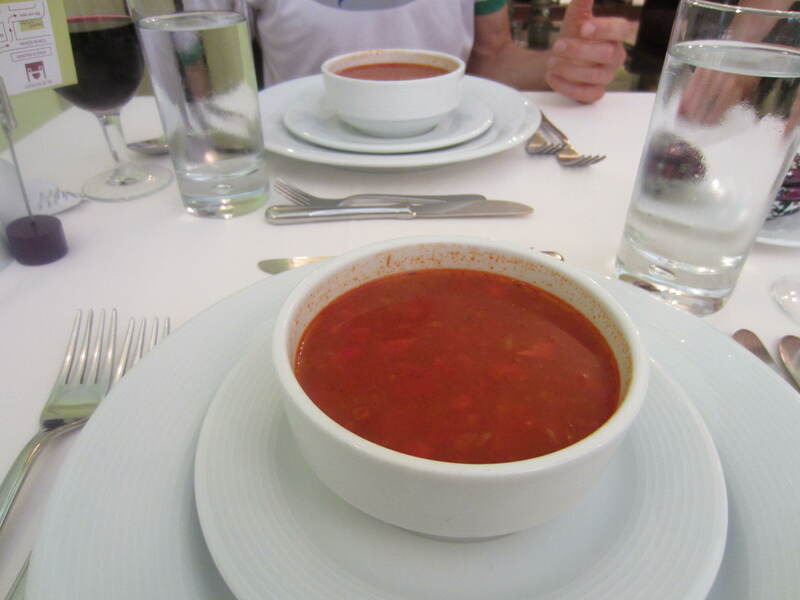 Our first dish, the dried okra soup with a tomato base, was excellent. It had some spice, and the okra melted in our mouths. We are not huge okra fans and were a little bit skeptical about eating it, but we were AMAZED at how delicious it was. We generally think of okra as a southern food, often fried. In this Turkish dish, okra is taken to a whole new level and is delicious! 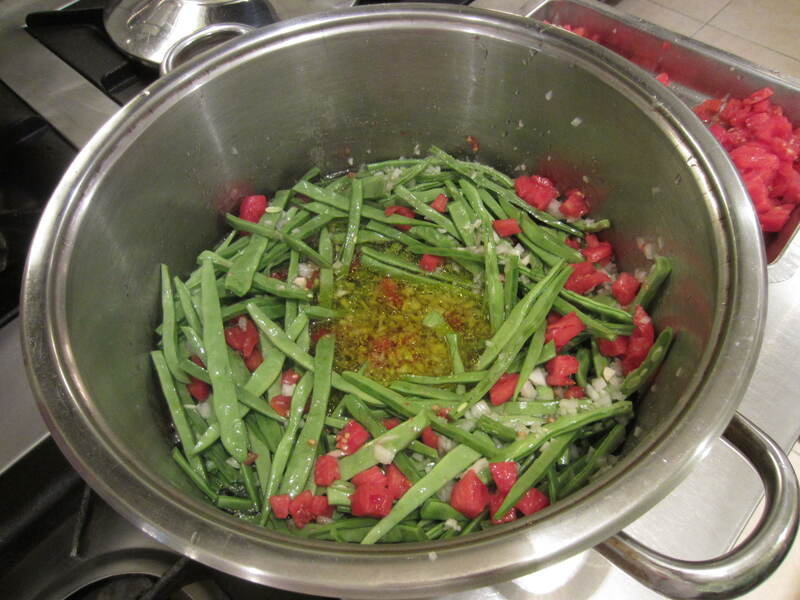 The second dish we prepared was green runner beans and tomatoes in olive oil. 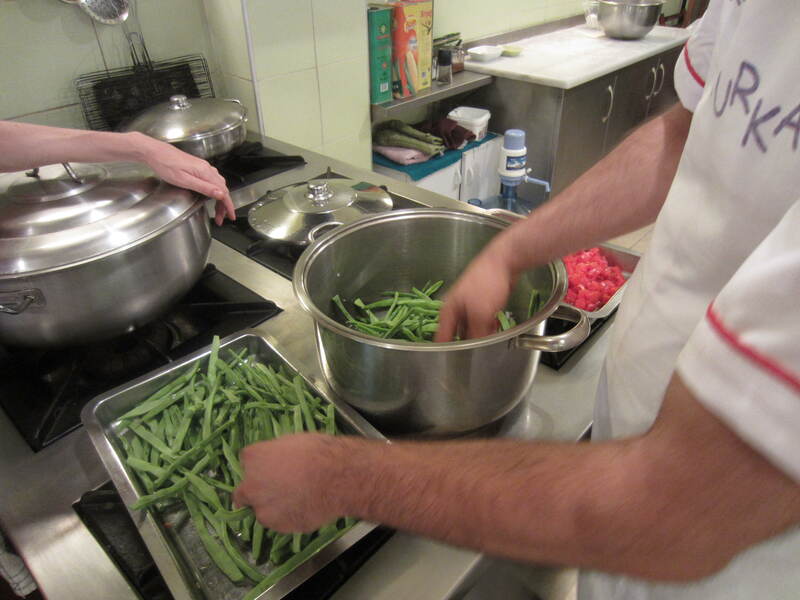 The Turks like to cook vegetables in olive oil, lemon, and often some sugar as well. This dish was less labor intensive but came out to be incredibly flavorful. 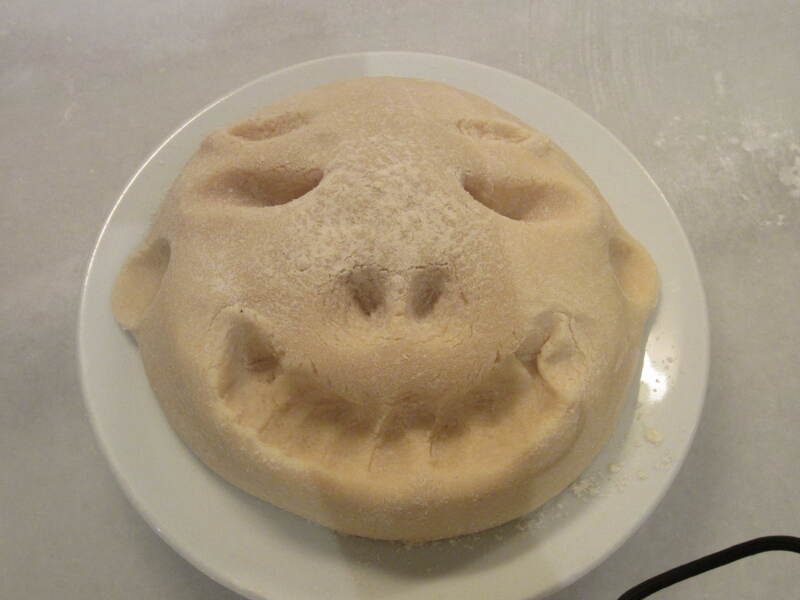 We are planning to prepare this dish once we are settled in Boston. If we cannot find runner beans, we will substitute regular green beans. This dish was a real keeper! The third dish was fried zucchini and white cheese patties. The Turks use a white cheese called beyaz peynir, which is very similar to a feta cheese. There is no name for it in English other than white cheese. The cheese is very mild but pairs well with most vegetables and tastes especially delicious for breakfast with Turkish bread! 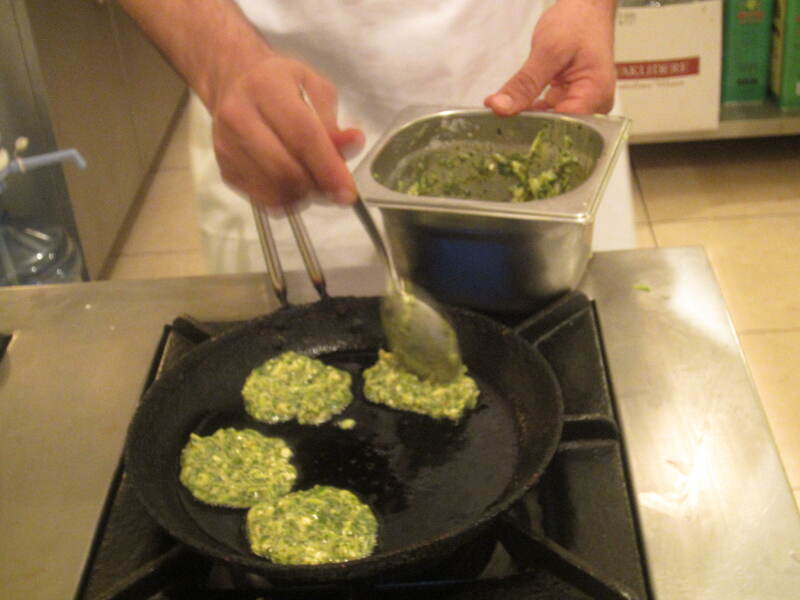 The zucchini patties we prepared were lightly fried and they tasted extremely fresh due to the addition of fresh dill, parsley, and mint. 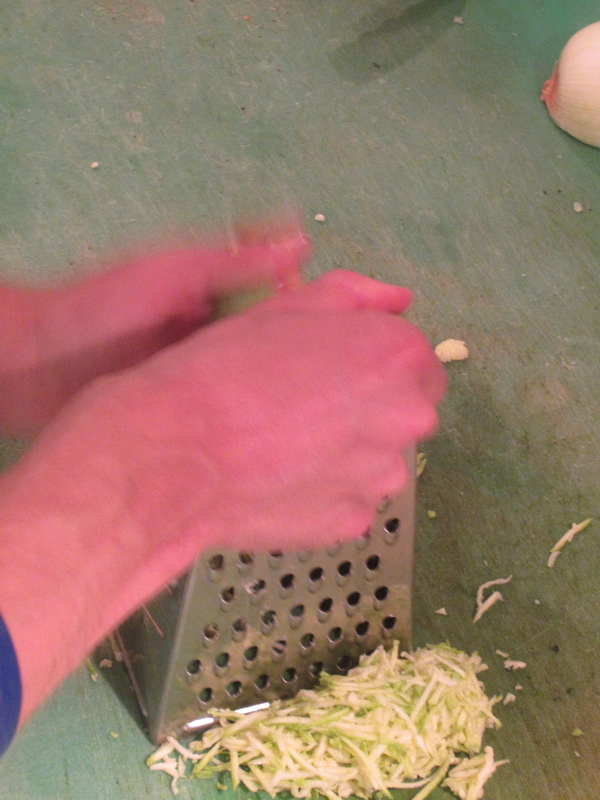 We only used fresh herbs and we cut them ourselves. 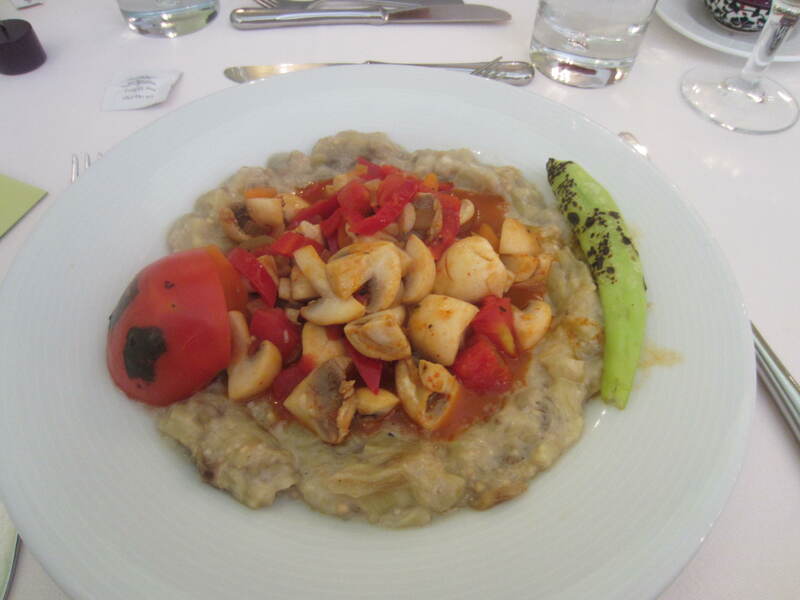 The main course was a famous dish from Turkey’s Ottoman period. The original dish is lamb in tomato sauce served on top of smoked and pureed eggplant, but since we were preparing a vegetarian meal, we made a mushroom ragout instead of the lamb. 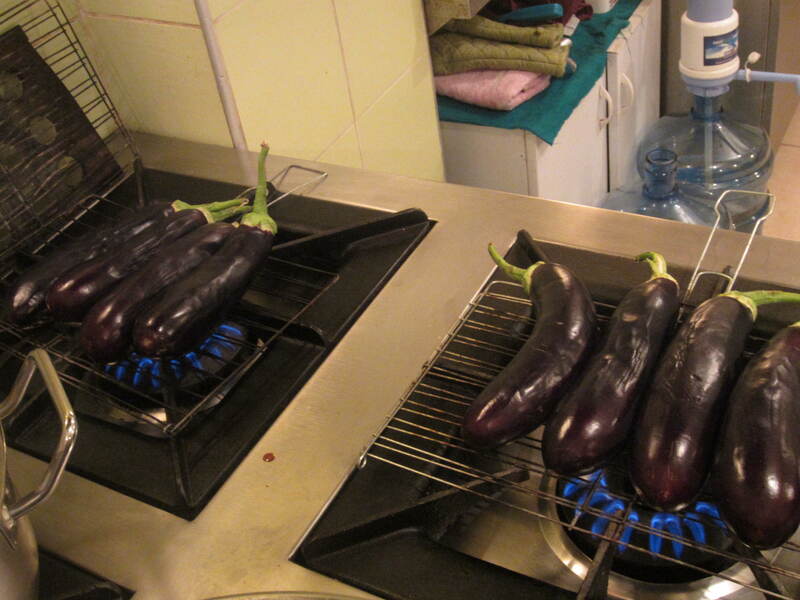 For this dish, we char-grilled the eggplants over the stove top until their skins cracked. Then we laborously peeled the eggplant, which was totally worth the effort because the eggplant was smoky and creamy, and it paired perfectly with the mushroom ragout. We had to remove every piece of skin (we double and triple checked each piece of eggplant) because the skin has a bitter taste and does not add to the dish. 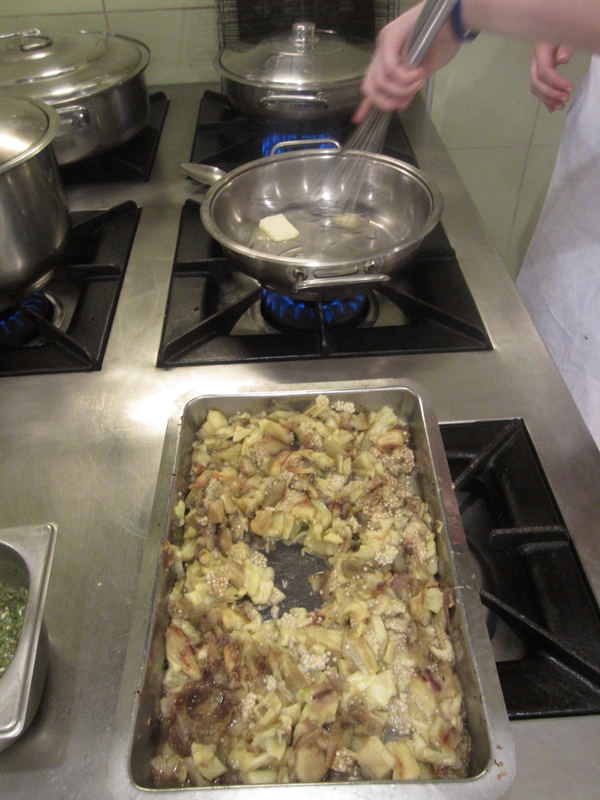 The eggplant puree was then mixed with a béchamel sauce. Even though it was very dairy, we did not feel full or bloated after eating it. Don’t kid yourself, we LIVED on Lactaid pills (for lactose intolerance) during the trip. Peeling the burned skin off of the smoked eggplant is such a tedious task! 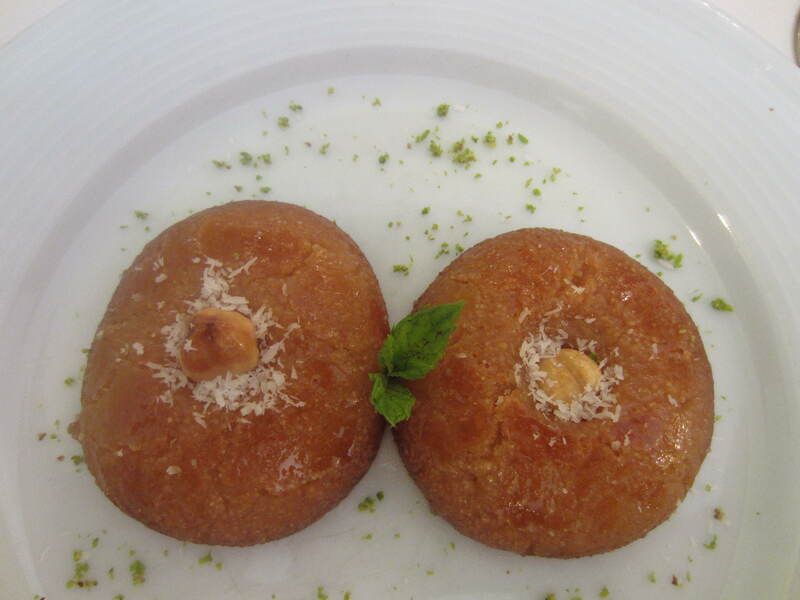 Our last course was semolina sponge cakes soaked in a sweet syrup. 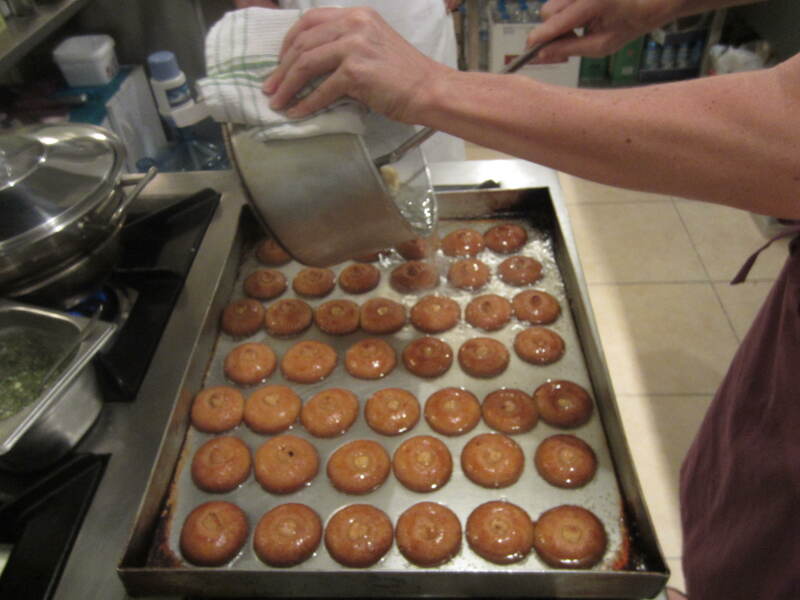 Adding the syrup to the semolina cakes immediately as they came out of the oven was the key to the dish – the syrup kept the cakes moist. 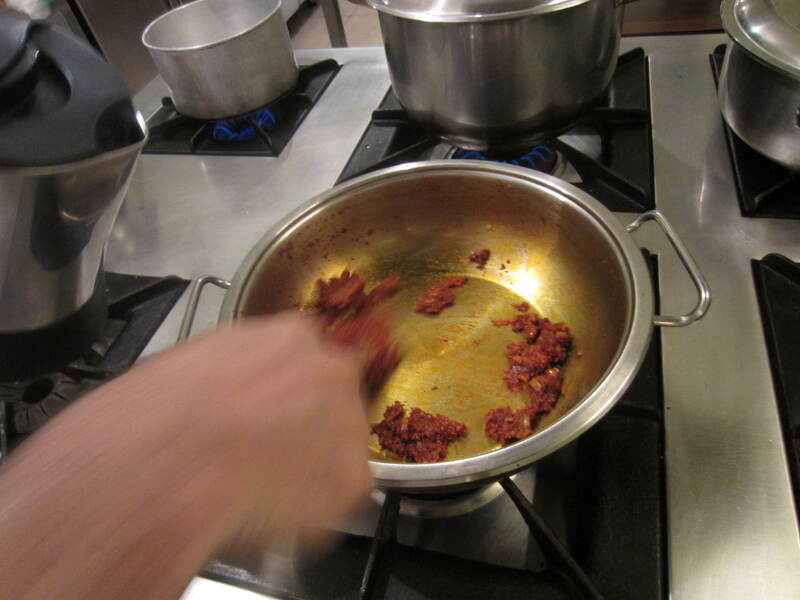 One of the great things about the class was learning special tricks, like layering the ingredients in the pot to make sure the flavors mixed. We also learned the best way to peel an eggplant (Feyzi was ready to chop my head off if I did not follow his direction). The best part of the class was enjoying all of our dishes at the end of the class with a glass of Turkish wine. It was one of the best meals we had in Turkey. 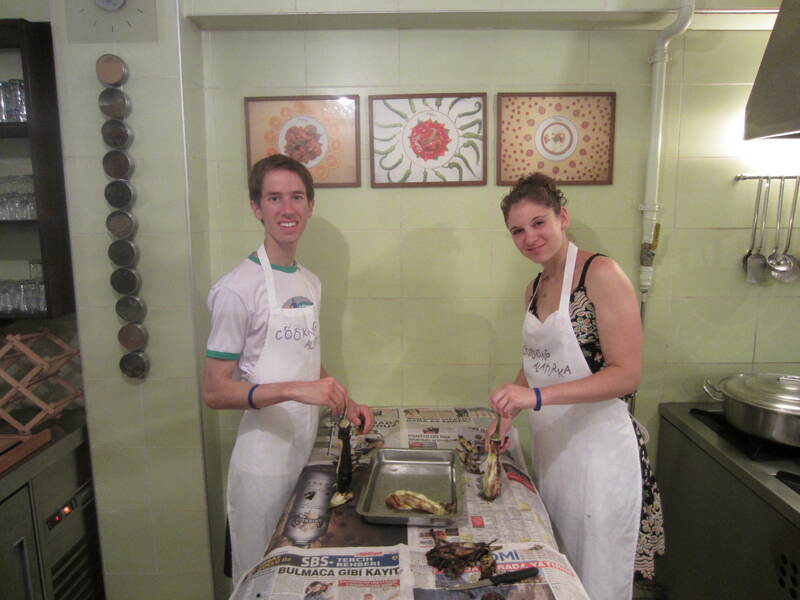 We are so glad that we were able to have this cooking experience in Turkey. 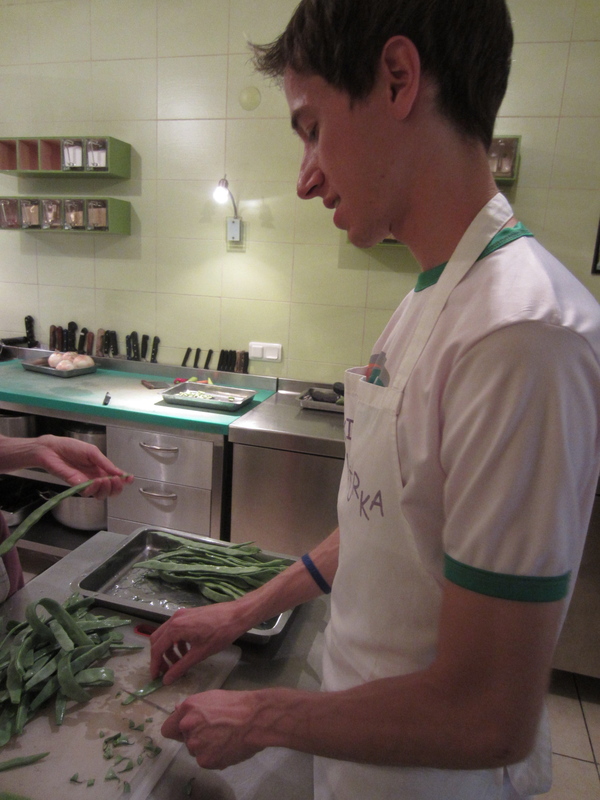 We were able to successfully modify dishes to meet Marnina’s dietary restrictions and we also got to educate Eveline (the director of Cooking Alaturka) about Crohn’s Disease. Mission accomplished! 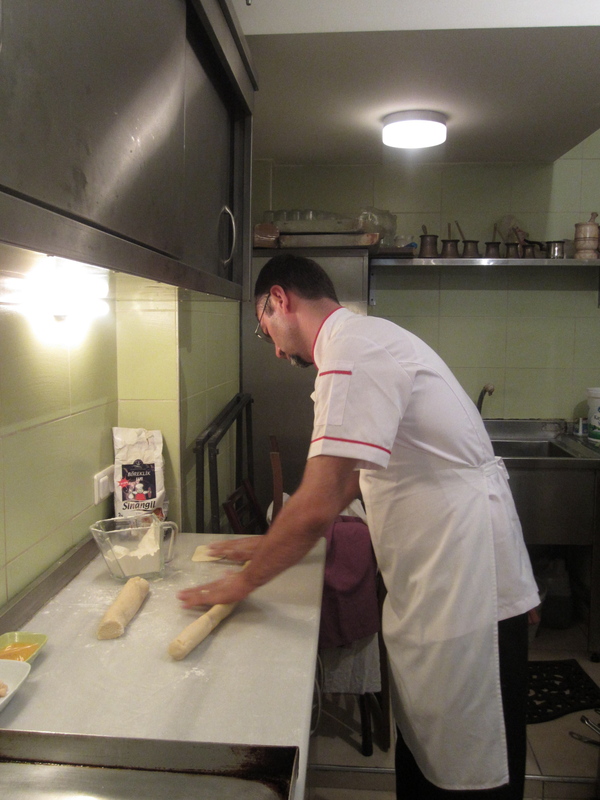 If you ever find yourself in Istanbul and want to have a hands-on Turkish culinary experience, visit Cooking Alaturka. 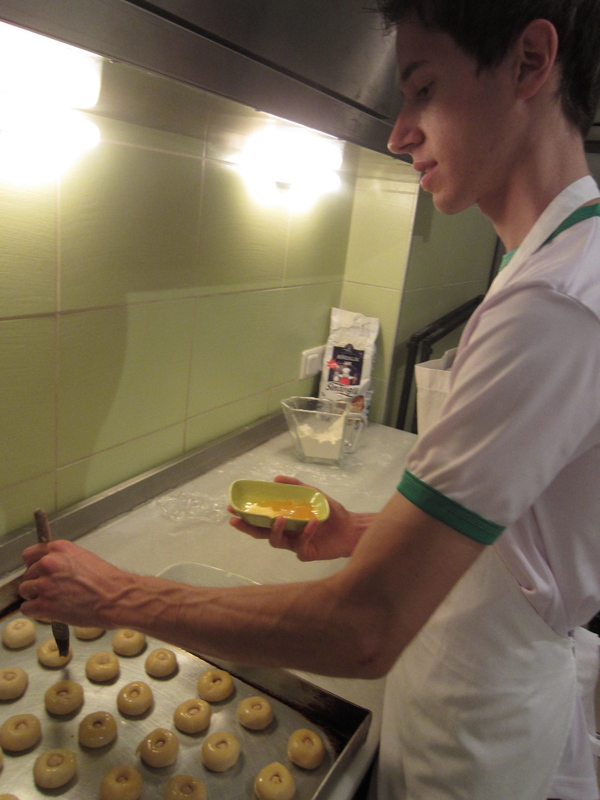 Eveline will work with you to make a menu that will meet your dietary restrictions. She has done low sodium and gluten free meals before. 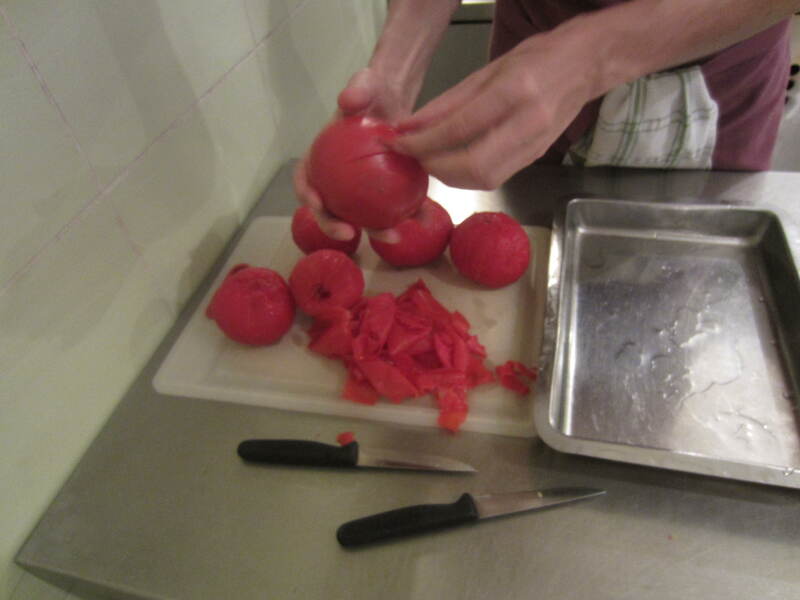 One of the best aspects of Turkish cuisine is that it is capable of being modified. Since most of the dishes have basic ingredients, they can easily be swapped out and substituted. 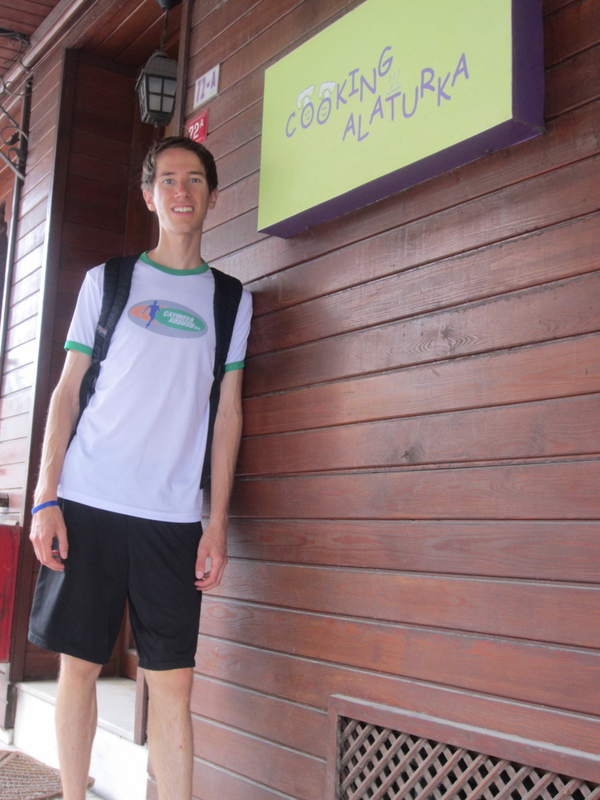 Don’t let IBD deter you from traveling and eating. As long as you are healthy, capable of advocating for yourself in a foreign country and interested in other cultures, get out there and see the world. Carry that extra roll of toilet paper in your backpack, extra prescription slips and rise above your IBD. The eggplant looks delicious! Kinda want to try smoking some, but I’m not sure I’m up to the peeling!